- Automatically fill and submit web forms with data from local files. - Retrieve and parse your emails and update a database with the data contained in the emails. - Launch applications, move, resize, close and manipulate windows, take screenshots. - Convert your tasks into your very own applications that you can share with others, with the press of a button. - Harvest web sites and extract data from any web page into Excel or text files. - Copy, move, edit, rename, compress, uncompress and manipulate files and folders in any possible way. - Read and write data to Excel files, connect to SQL databases and manipulate text files. - Run any task using the built-in scheduler, when you press a hotkey, when a file is created or deleted, when your site is down or when you receive an email. - Send prerecorded mouse clicks and keystrokes to any desktop application. - Automate your FTP transfers: Download and upload files or entire folders at schedule. - Include logic to automate even the most complex tasks. - Combine all the above to design custom tasks for your specific needs. Want to update your CMS the moment the update comes out and never have anything to do with it ? Maybe download all logs and copy them to Excel? Or setup some other automated process to handle your uploading and downloading to FTP? 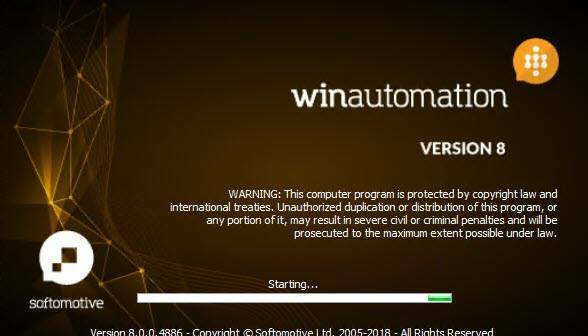 WinAutomation has the answer yet again!